Dutch Design Week kicked off in Eindhoven today, and Dezeen is in town hosting debates about whether design can tackle global issues. We've picked out 10 other worthy events and exhibitions, from an "embassy" exploring the future of food to a plastic recycling workshop. Dezeen is media partner for Dutch Design Week, which runs from 21 to 29 October 2017 in Eindhoven. There are over 600 events taking place across the city as part of the week-long festival, which this year has the theme "stretch". These include Good Design for a Bad World, a series of five discussions hosted by Dezeen editor-in-chief Marcus Fairs, looking at whether architects and designers can provide solutions to the world's biggest problems. But there are also many other exhibitions and events that show ways that designers are trying to make a difference, from proposing new methods of recycling to exploring sustainable approaches to construction. "Today's world is complex and poses enormous challenges," said Martijn Paulen, director of the Dutch Design Foundation. "Designers have revolutionary ideas and innovative solutions for the future, sometimes inspiring, sometimes confrontational." 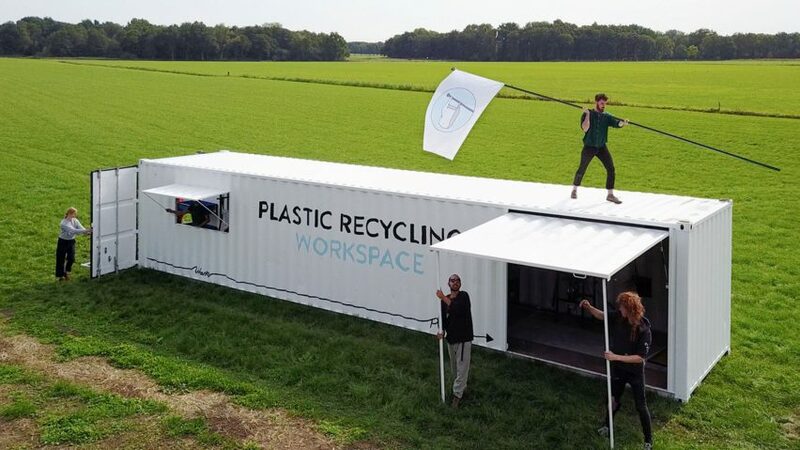 Four years after first presenting his machines for recycling plastic at Dutch Design Week, designer Dave Hakkens has returned to the city to set up a mobile workspace, where he is showing designers how to make their own recycled plastic objects. Called the Precious Plastic Container, the mobile workspace is housed in an old shipping container. Hakkens has also using his website as an open-source platform where people can share information and tutorial videos, to help anyone make their own DIY plastic recycling workshop. Like Dezeen's Marcus Fairs, MVRDV co-founder Winy Maas is a Dutch Design Week ambassador, so the Rotterdam studio is presenting four projects for this year's event, looking at how cities will develop in the face of issues such as climate change, declining resources and rapid population growth. Among them is this pavilion made of nine rooms that can be moved into different configurations, allowing it to adapt to the different needs of any future inhabitants – whether they be families, students or refugees. Seven students from Bauhaus Universität Weimar present concepts for sustainable materials and products in this exhibition. Exhibits include a raincoat made from bio-degradable and waterproof paper, vinyl records made from bioplastic and a jacket created from self-growing textiles. There are seven "embassies" opening across Eindhoven throughout Dutch Design Week, each addressing a different issue facing humanity. Among them is the Embassy of Climate Change, hosted by design conference What Design Can Do, which will explore ways that people can survive and adapt to global warming, and the Embassy of Food, which looks at sustainable ways of growing and processing food. The focuses of the other five embassies are data, health, urban transformation, intimacy and, most unusual of all, robot love. Dutch Design Week ambassadors Atelier NL are addressing the global sand crisis with their installation. Studio founders Nadine Sterk and Lonny van Ryswyck have sourced sand samples from all over the world and have used them to create different types of glass. They are displaying these regional varieties, to encourage glassmakers to reduce their consumption of rare white sand. Throughout the week, eight designers are teaming up with eight human-rights defence lawyers to develop proposals that could to create better situations for vulnerable people. Organised by Studio Bernhard Lenger, the event aims to uncover the flaws in existing systems, rather then simply come up with new ideas. Another designer working with recycled plastic, Jessica den Hartog has been exploring ways to make this material more attractive. After discovering that HDPE plastic usually becomes plain grey when recycled, she has been experimenting with new techniques that might allow for colour. She presents her findings on one of the six ABN AMRO Hotspots – a series of exhibition platforms curated by Van Eijk & Van der Lubbe. The venue for Dezeen's Good Design for a Bad World talk series, People's Pavilion is a temporary structure that was built using only responsibly sourced materials, all of which will be recycled once Dutch Design Week is over. Designed by Bureau SLA and Overtreders W, the pavilion's most striking feature is its colourful shingle facade, created from waste plastic. It also boasts a wooden structure that was assembled without glue or nails – instead, tension belts and cable ties hold things in place. Food design studio Botanic Bites is inviting Dutch Design Week visitors to sample sausages made from oyster mushroom stems – typically a waste product. The studio is using the stems to produce sausages that are 15 times longer than usual, to demonstrate how much more food can be produced from plant protein than meat, when using the same quantity of resources. Minnesota- and Amsterdam-based Architects for Society first unveiled its concept for a rapidly deployable dwelling, able to house victims of catastrophic events, in 2016. The studio is presenting its first European prototype for the first time at Dutch Design Week. Called Hex House, the 47-square-metre modular unit is largely made of Structural Insulated Panels (SIPs), which can be flat-packed and delivered by truck to a building site. Each home is designed to cost less than £32,000 to build, but could be occupied for 50 to 70 years.